Whole house water filters have taken center stage as concerns over the purity of municipal water supplies rise. If you want to ensure that the water your family uses on a daily basis for drinking, washing and cooking is as healthy as possible, then whole house filters are definitely the way to go. Nothing provides more thorough and effective coverage, no matter the size of the home or the specific contamination concerns. The reasons for filtering water are obvious, but what makes whole house units so important? The answer is simple…the average house has dozens of water outlets and nothing else covers them all. While most filters can provide elimination of contaminants such as lead, chlorine and VOCs (volatile organic chemicals), only a whole house water filter can ensure purification from every faucet and shower head in the home. The need to cover all the water outlets in your home is crucial. Most of us realize how important it is to purify the water we drink and cook with, but the fact is that most of the contaminants we are exposed to on a regular basis are absorbed through the skin and hair or breathed directly into the lungs while showering. Only whole house water filters can provide coverage for showers as well as faucets. There is a broad range of filter systems available for the home. A whole house water filter can do everything from remove chlorine to balance ph levels to assure that water is pure and healthy. Reducing contaminants in the water supply can help to prevent respiratory ailments such as asthma and bronchitis, and even lower cancer risk. Since buying a filter system for your home is such an important decision, you’ll want to go about it carefully. Pay attention to the manufacturer’s specifications on various whole house water filters so you know exactly what you’re getting. Generally, a multi-step system will ensure maximum elimination of contaminants and provide the most healthful water. Not only do you want water that is safe to clean and cook with, you also want water that tastes good. Not every whole house water filter is created equal, so be sure to check all the specifications for each model. Charcoal enhances taste and clarity, so choosing a system which uses charcoal at some point in the filtering process is important if you’re concerned about the taste of your water. While there are effective models which attach at the point of use, generally a point of entry system will provide maximum coverage at minimum cost. Whole house water filters which attach at a home’s main water source (point of entry) allow you to address all of the outlets in your home with one product, lowering overhead costs. Having clean, pure water for daily use is essential to maintaining your family’s health. With the variety of water filtration systems available today, that is an easily attainable goal. Just take a few minutes to educate yourself about the choices available and you’ll be able to find the product which best fits your needs. A clean home is a happy home, and cleaning house begins with purifying your water supply. 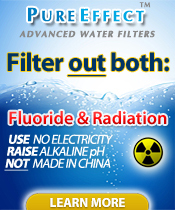 Multipure is introducing new designer water filters. These filters are available for a limited time and each purchase contributes to cancer research foundations. This is really the gift that keeps on giving. Fresh, healthy water and help find a cure. The Multipure Aquaversa Pink is a special edition of the countertop Aquaversa and was commissioned by Multipure’s Pure Foundation. This stainless steel system features the bright pink housing and a custom black angled acrylic base. $100 of each sale is donated to the Susan G. Komen organization for breast cancer research. These designer colors are sure to be a hit in anyone’s kitchen! Mulitpure water filters make the perfect family gift! As a mother of two young children, balancing work and family life, Jennifer Rice knows the importance of drinking water, especially when it’s impossible to constantly monitor the family’s water usage. Through Multipure, she already provides better health for her family through better, cleaner water. Through The Pure Foundation, she hopes to provide that same knowledge to families everywhere, so that they can gain the benefits of cleaner, more healthful water, as well. Multipure’s Aquaversa (MP750sb) has once again been rated one of the best home water filters! Consumer Reports tests many consumer products to see if they stand up to and perform as advertised. If a product, like a water filters, passes all of their testing, they report to the consumer. These test results are not sponsored. They are real results from real tests. Lead removal indicates the percentage of lead that was removed by each filter. Chloroform removal rates the percentage of chloroform removed. A filter’s ability to remove chloroform predicts how well it will remove many organic compounds as well as byproducts created by disinfectants used by water systems. Flow rate is how fast a gallon of water filtered throught the cartridge. The criteria for flow rate scores differ between different types of filters. Faucet-mount, countertop, and undersink models have the same criterion; carafes and reverse osmosis models each have their own. Clogging measures how well the filter retains its flow rate over time and whether it stopped flowing completely before its claimed life span. The entire line of Mutipure home water filters is just a click away. The safest water you can drink, is right at your kitchen sink. Multipure! GET A FREE Water Emergency Treatment System With Purchase of a Multipure Drinking Water System! From July 1st through September 30th, Multipure is offering an all-new Water Emergency Treatment (WET) System for just the cost of shipping to Customers who purchase any Multipure Drinking Water System at regular price! — Or if you purchase any Drinking Water System Starter Kit at regular price and sign up as a new Distributor, you can receive a WET System absolutely FREE! The WET System includes two Multipure EF8 solid carbon block filters as well as emergency water purification tablets and other essential equipment. Free WET System plus $10.00 S/H fee when purchasing any drinking water system. 1. Offer valid July 1, 2014 through September 30, 2014. 2. A Multipure Drinking Water System (DWS) is defined as an Aquamini, Aquadome, Aquaversa, Aquaperform, orAquaRO. 3. Multipure’s Aquasource whole-house system is included as a qualifying promotional purchase. 4. Customers may receive one (1) Water Emergency Treatment (WET) System (SKU# SA912) when they purchase any DWS at regular price. 5. The free SA912 must be requested at the time of purchase. No exceptions. 6. Customers who cancel their DWS or DWS Starter Kit order (at regular price) must also pay the full price for the SA912 or return the SA912. 7. Shipping and handling on the free SA912 is not included. The Customer must pay for the $10 shipping and handling at the time of purchase. 8. The SA912 is shipped with the DWS purchase and may not be shipped to a different address. 9. The SA912 promotion is available with Filtermania and Aquamania purchases. 10. This promotion is subject to change or may be discontinued at any time. You will face a lot of challenges going from being an employee to a small business owner, and one of the unexpected ones you will stumble across is investing in a water cooler for your staff. It is your responsibility as an employer to provide a safe and constant supply of drinking water to your workers, and offering a water dispenser is a great way to provide a chilled and tasty alternative to the tap. Keeping your employees hydrated boosts morale as well as levels of concentration, but choosing a machine is not always as easy as it sounds! The first thing you have to consider when choosing a water cooler is how it will fit into your office. There are a variety of models to choose from, and the layout of your workspace can dictate which one to pick. For example, bottled water coolers are a great idea for smaller companies, because they only need a square foot of space and there is no plumbing required for their installation. However, you will need room to store the plastic bottles. For larger businesses with more employees, mains fed water coolers can be a more convenient and cost effective alternative to the bottled water cooler. Mains fed water coolers draw their water straight from the main supply, which means there is no need for the ordering, delivery, storage and disposal of plastic bottles. This type of machine will also never run out of water. If you do choose a mains fed water cooler, you can then decide whether you want a freestanding, countertop or under the counter model. Countertop models are ideal for businesses that are short on space, because they fit snugly on the surface without taking up unnecessary room. Hot, or cold, or both? Another decision to make when choosing a water cooler for your business is whether to choose a dispenser that also provides hot water. There are many benefits to this type of machine, primarily time saving. Hot water dispensers replace the traditional kettle, so your employees no longer need to waste time boiling the kettle when they are doing to tea round. And because the kettle is not being boiled needlessly again and again, your electricity bills will be lower and your environmental impact less severe. Plus, you no longer need to tell them to get back to their desks when they hang around the kettle hung-over on a Monday morning! As well as hot water options, some water coolers also dispense sparkling water. By combining all three together you can guarantee that all your employees will find a drink to suit their taste. Not only that, but your clients will also benefit from the wide range of beverages offered when they come and visit you. Finally, you need to make a decision as to whether to rent or buy your water cooler outright. There are benefits to both options, but most businesses prefer to rent their machine. Firstly, renting your machine means that it is delivered and installed by a professional. Secondly, you will receive service and hygiene visits on a regular basis by the water cooler company. And thirdly, all repairs and labour will be included in the rental fee, so you are not hit by any nasty hidden costs if the machine breaks down. So now you know how to find your perfect water cooler what are you waiting for- get researching!